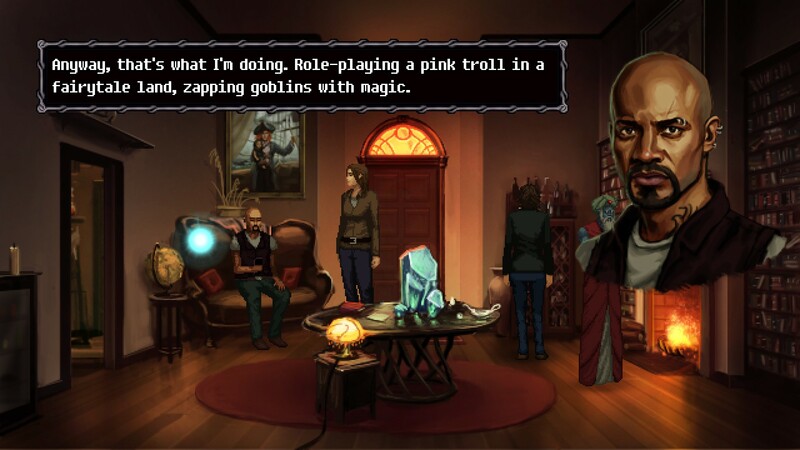 Wadjet Eye consistently puts out some of the best modern point and click adventure games. You can always rely on them to weave a gripping and insightful story, whether it’s the post-apocalyptic musings of Shardlight and Primordia or the ghostly escapades of the Blackwell series. They always deliver classic adventure game puzzles, but with far more internal logic and consistency than the trial-and-error “moon logic” that plagued many of the genre’s forebears. Unavowed is no exception. Set in present-day New York, it follows the exploits of group of supernatural detectives—the titular Unavowed—as they investigate a series of strange incidents across the city. With a setup not unlike a police procedural, it delivers intrigue, excitement, humour, and moral philosophizing aplenty. The story begins on a rainy night atop an old apartment building. Your character is in the midst of being exorcised; though you have no memory of it, you’ve spent the last year being possessed by a demon who’s been running rampant. 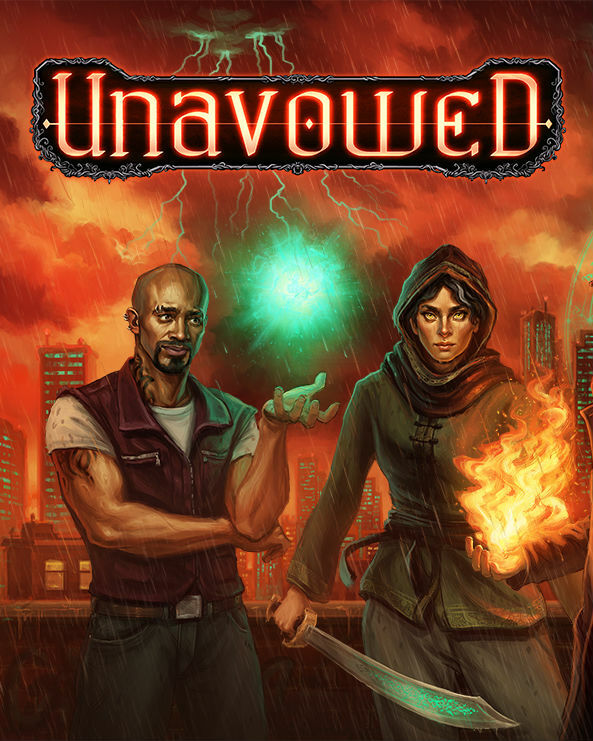 Luckily, the exorcism is a success, and in an effort to make amends find out what happened and make amends, you join the Unavowed. From there, things settle into a neat ebb and flow; each new chapter offers a new case to explore: an unexplainable arson case that has the police stumped; a spirit medium trapped in a haunted house; the mysterious disappearance of a young woman and the even more mysterious way nobody close to her seems to care; and so on. Thus the comparison to a police procedural—each episode stands alone, with its own key characters, a case to solve and puzzles to work through, and a satisfying resolution at the end. Typically, these episodes comes with some sort of moral quandary to explore. When you accidentally summon a flesh-eating demon from another dimension, who’d otherwise have no need or desire to feed on humans, do you let it eat the innocent victims of a killing spree that’s yet to be discovered by the cops? Or do you kill the creature then and there? People-eating aside, the demon seems fairly civil—friendly, even—and he hasn’t done anything wrong, yet. That example sounds rather silly in isolation, but the sharp dialogue, excellent voice performances, and the heavy atmosphere make it convincing. And once you suspend disbelief, you can jump into the philosophy at the heart of such a dilemma: is anyone, or anything, inherently evil? Is it okay to “sacrifice” the corpses of the deceased in order to save others who are still alive, or are the dead too sacred? Can there ever be such a thing as pre-emptive, preventative justice? Video games have been trying to do “moral choices” for years, but they rarely amount to more than a gimmick. 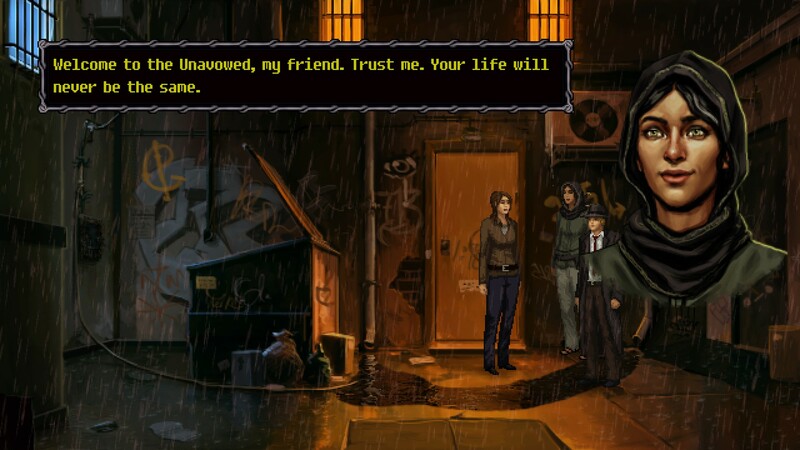 Unavowed is one of the few that really finds meaning in the problems it brings forth. As you’d expect, those individual choices and the episodes that surround them all feed into something much bigger. There’s more to the demon that possessed you than meets the eye, and it seems to be connected to every one of these otherwise isolated incidents. That all builds up to a genuinely surprising late-game twist; I won’t spoil it, but suffice to say it plays with Unavowed‘s light character customisation options—a custom name, male or male gender, and one of three professions—in a brilliant fashion. For all its moral philosophising, Unavowed never strays into overly academic territory. That, again, comes back to the stellar dialogue that keeps the game grounded in humanity. It’s thoughtful, often funny, and always written and delivered in a way that comes across as completely natural. You’re surrounded by an eclectic bunch of supernatural detectives: a stoic, centuries-old half-jinn; a wisecracking fire mage; a spirit medium who’s always accompanied by a happy-go-lucky ghost child that only he can see; and a no-nonsense Staten Island police detective. Each is a complex, well-rounded character in their own right, and they make a story as outlandish as Unavowed feel real. 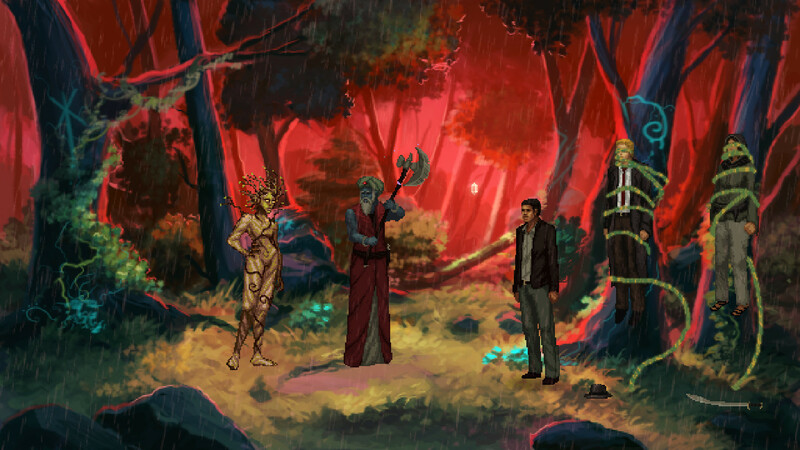 The varied cast also lends itself to one of Unavowed‘s more unique elements, at least within the adventure game space: a party system. For each new case, you get to choose which two of your four allies accompany you, and that in turn affects how events play out—not just story-wise, but in terms of the puzzles as well. 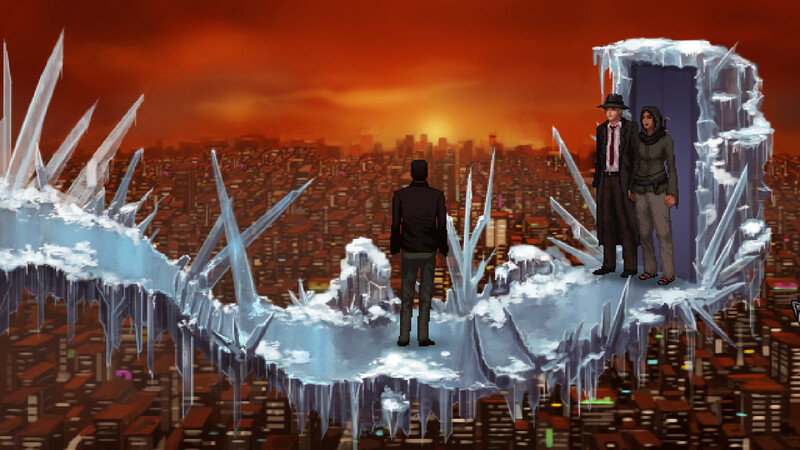 Each other member of Unavowed has a couple of unique skills at their disposal; because of this, puzzles can change quite dramatically depending on who’s with you. The ultimate goal remains the same, but you’ll find different clues with Logan’s ability to talk to ghosts than with Eli’s fire-reading or Vicky’s detective savvy. Beyond simply offering more variety for repeat playthroughs, the party system also makes each case feel much more personal, and builds those all-important relationships. The more time you spend with certain characters, the more you’ll learn about them, and the more they’ll make an impact on you. It would have been very easy for this sort of structure to dehumanise characters—to turn them into nothing more than items, which is, mechanically, how they function—but instead, the thoughtful implementation makes the cast even more relatable. The puzzles themselves mostly find the right balance between being thought-provoking without being obtuse. A lot of older adventure games are infamous for the bizarre logical leaps you’d need to make if you wanted to solve a puzzle without resorting to trial and error. Unavowed tends to avoid that sort of moon logic. A couple of puzzles stumped me because I wasn’t entirely sure what was being asked of me, but for the most part, solutions are never too far away, so long as you’re observant. The final touch is just how beautifully presented the whole game is. With its low-resolution but detailed pixel aesthetic, every scene looks like a painting. That’s especially impressive when the more fantastical elements come out to play; exploring a island of ice floating high above the New York skyline, while ominous, orange-tinged clouds hang low in the backdrop, is a surreal experience indeed. An atmospheric soundtrack rounds that out, perfectly carrying the emotion and excitement that runs through every scene. In short, Unavowed is an excellent game. It’s obviously made with old-school point and click fans in mind, but it never gets trapped in the more archaic elements of the genre. It all comes together to deliver a gripping urban fantasy adventure that effortlessly balances philosophical depth with humour and humanity.